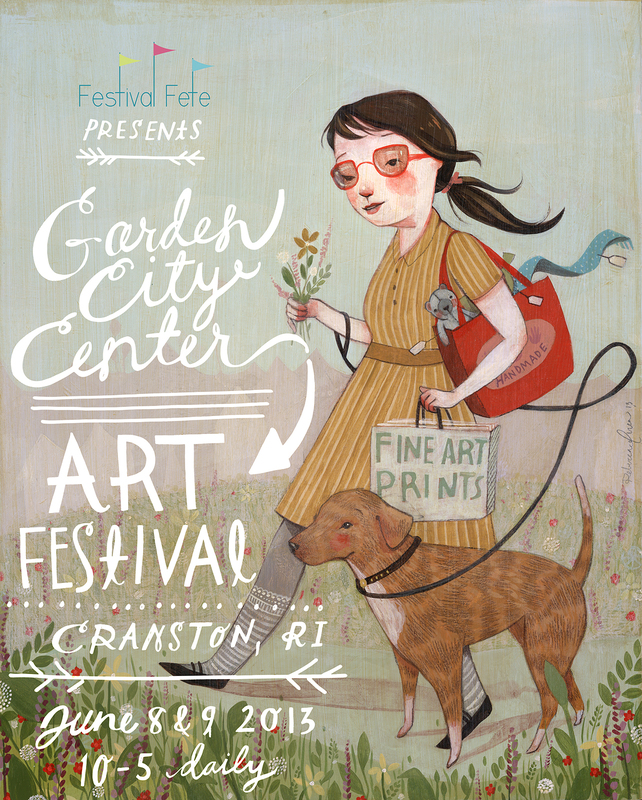 You can see all of these artists at the Garden City Art Festival on June 8th and 9th in Cranston, Rhode Island. 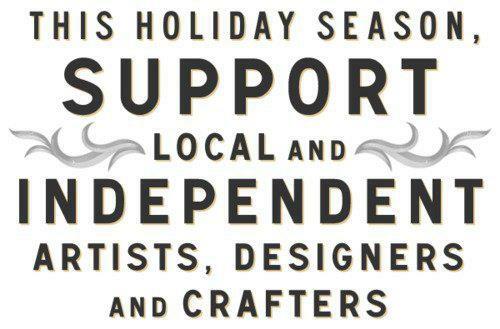 This month we are talking about shopping local, and preferably hand-made as a way to give to your community. Well this weekend you’ve got a great opportunity to do both at the Ocean State Artisans 22nd Annual Holiday Crafts Festival. Our show is a charity fundraiser; all admission receipts are donated to local RI charities. This year we will have volunteers from Rhode Island Communities for Addiction Recovery Efforts (RICARES) to help our members with unloading their cars, so RICARES will receive the bulk of admissions receipts. RICARES works to increase retention and prevent relapse among people who transition from active addiction into recovery from addiction. In other words, RICARES helps people who have stopped using drugs. We also gave Meeting Street School students 500 bags to decorate, and these bags will be for sale at the door. Meeting Street will also be selling their beautiful holiday cards. And of course we’ll be collecting food for the Rhode Island Community Food Bank. Normally you’d pay $2 to get into our show, but with a food donation you can get in for just $1. Last year we collected over 5,000 pounds of food! 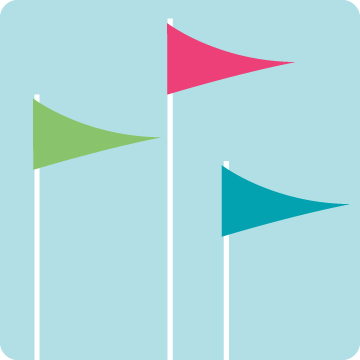 The Ocean State Artisans Craft Festival is held at the Community College of Rhode Island‘s Knight Campus in Warwick from 10am – 5pm Friday and 9am – 4pm on Saturday. They have 96 crafters this year, up by almost one third from last year. There is plenty of free parking and it’s in a convenient location to the mall – if you are brave enough for that! We’ve got amazing items, alpaca sweaters, prints, paintings, aprons, ceramics, innovative jewelry, highly crafted boxes, and gifts galore. In fact, we’ve got some amazingly innovative, locally made gifts you won’t see anywhere else, at prices you can afford. So not only will shoppers save money, they’ll feel good knowing that they’ve helped support the local economy. The Newport Art Museum Faculty Holiday Arts & Crafts Sale – Creative, unique gifts for everyone on your holiday shopping list – including you! All items are made by Coleman Center faculty. 20% of the proceeds benefit the Coleman Center. The Providence Holiday Market begins on Saturday, November 24th, also known as “Small Business Saturday” created by American Express. Outdoors in “Grant’s Block” at the corner of Union and Westminster Streets, the happy tent city of artisans, farmers and food vendors are there every Saturday from November 24 to December 22 between 11AM and 4PM. Take a break from the malls and shop Westminster Street. From all of us at Festival Fete, have a very Happy Thanksgiving and stay tuned on Friday for another sneak peak at some of our fabulous artists that will be at Festival Fete’s Holiday Market on Dec. 1st and 2nd – THAT’S NEXT WEEKEND!! We are very thankful for our sponsor, Snip-its! Pow!Science! 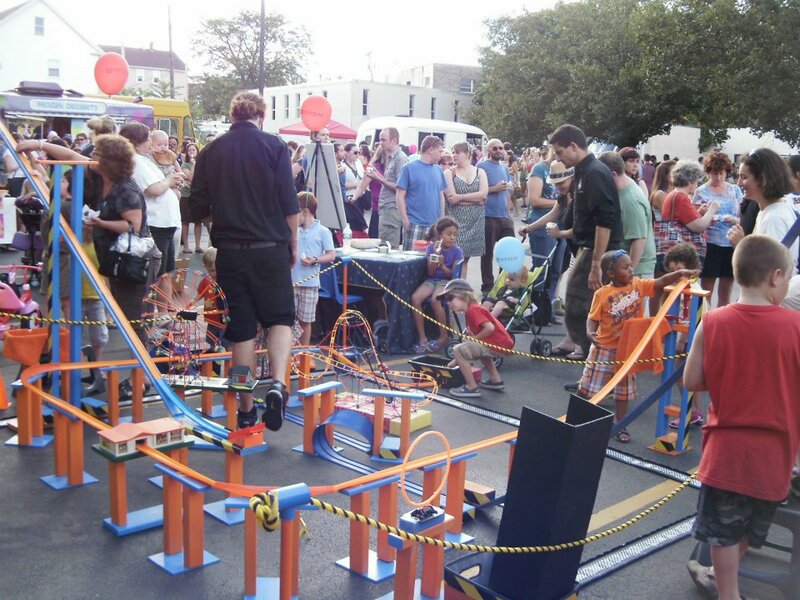 was a HUGE hit at Festival Fete’s last event – the East Greenwich Art Festival, and we are so happy that they will be entertaining guests (of all ages) at Festival Fete’s Holiday Market! My 8-year-old son was so enchanted with the race track he wanted to stay there all day. In fact, as soon as we got home he immediately began to set up his own version of a race track layout with his Hot Wheels tracks and cars. I love to see toys that are build-able, creative and stand the test of time (I remember my brother playing with these in the 1970’s). In fact, I’m sure that the reason that toys like Lego’s and Hot Wheels tracks have remained popular for decades is that they are adaptable to kids of all ages and there is no limit to how many creative ways you can play with them. When you see the guys from Pow!Science! 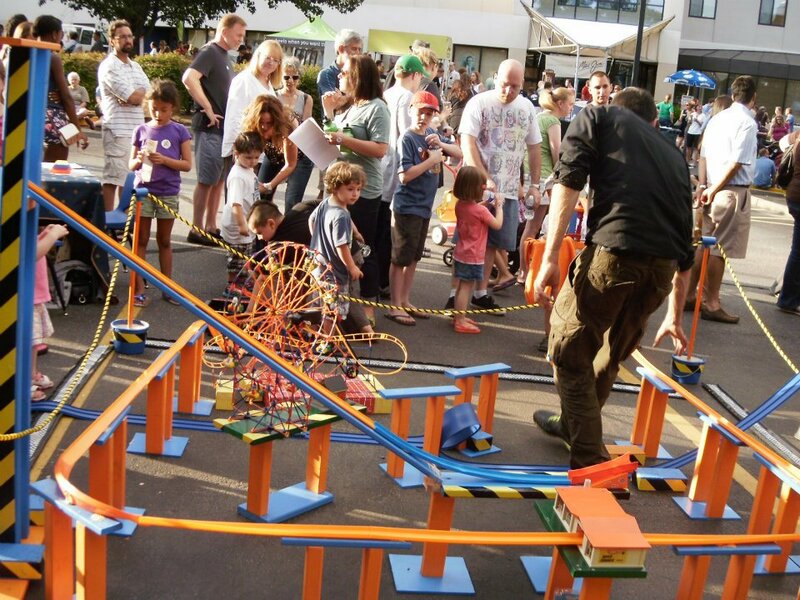 in their race track at Festival Fete, you will certainly see their enthusiasm for this classic toy! 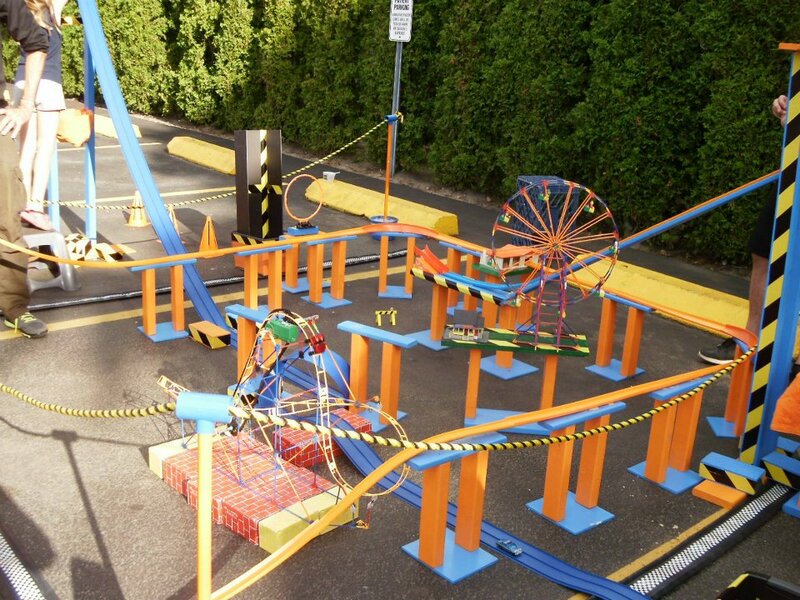 We’re very excited to participate at Garden City: we’ll be once again presenting our incredible Hot Wheels & Blu-Track layout–a 10×10 foot interactive race track for kids to play with. 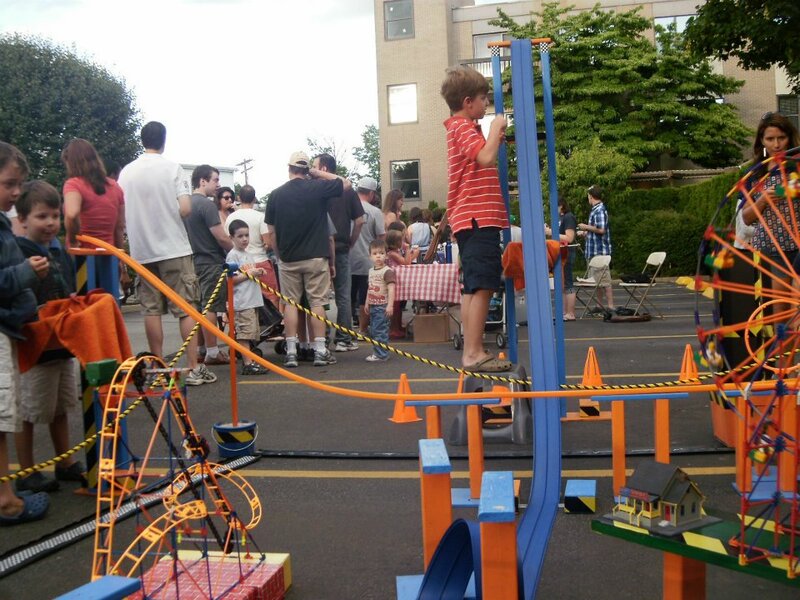 We’ll be there with 50+ feet of track that will keep kids happy & busy. Adults generally find it pretty compelling as well. – Eric B. Pow!Science! As you may know, Pow!Science! is so much more than an educational store; they offer classes for home-schoolers, scouts, libraries and at schools in the classroom or as part of an assembly or after school program. They will host completely fun and interactive birthday parties (I thoroughly enjoyed the volcano building and Mentos + soda explosion at the last party my son attended there). In addition to all of those fun options, the biggest in-store event of the Fall at Pow!Science! 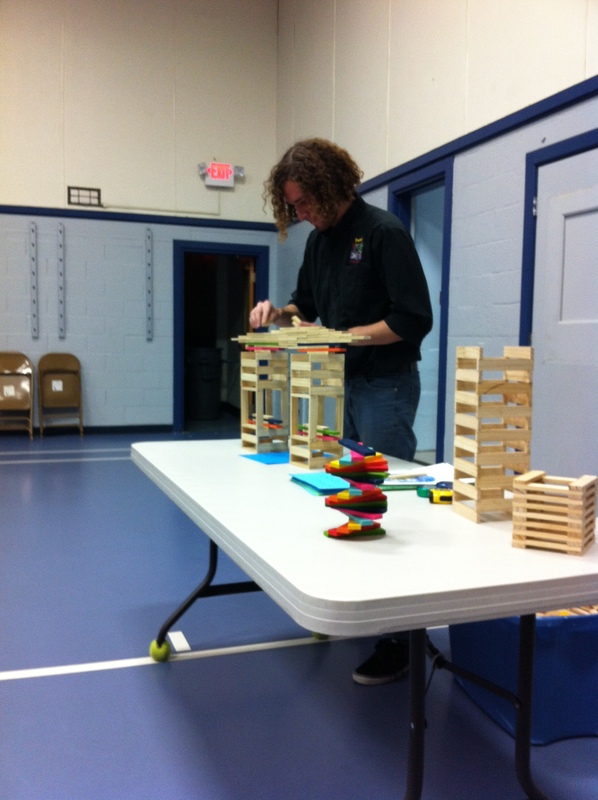 has been their Lego Club, which is a free event held weekly at both locations. It’s a ‘drop in’ event, come when you want, stay as long as you want, and build. The Pow!Science! Lego Club meets in the Activity Room on Tuesdays in Providence and Thursdays in Wakefield from 4:30 to 6pm. Visit the Pow!Science! website for more information. Pow!Science! 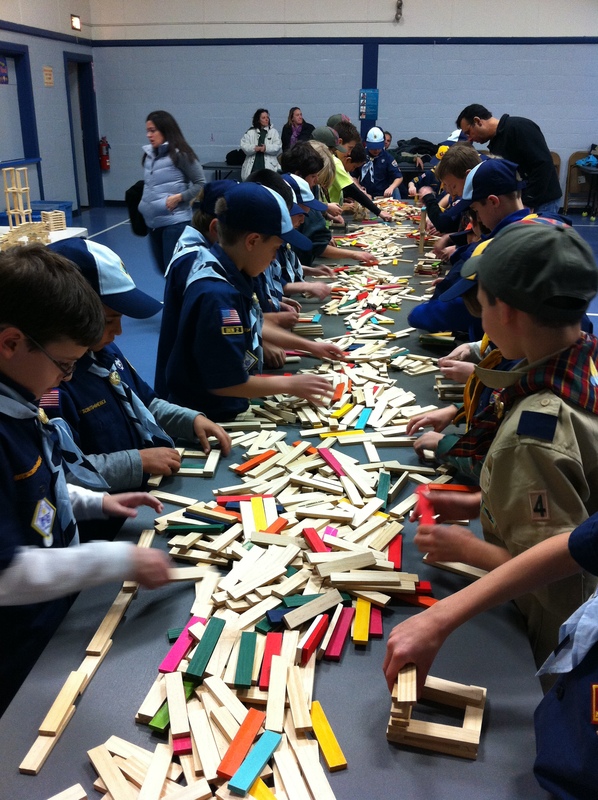 brought 4000 blocks to my son’s Cub Scout meeting last night for some competitive tower building for 60 kids. Wow! We love having them at our events, and are so happy that they will be at the Holiday Market on December 1st and 2nd in Garden City. Pow!Science! is a real gem and a gift to Rhode Island – Jennifer Neuguth. Setting up and getting ready for the frenzy of building boys! Time’s running out to enter the drawing! Click on this image to sign up. Many thanks to our sponsor and wonderful hosts for Festival Fete’s Holiday Market, Garden City Center ! I love to give hand-made gifts. I look forward to the holiday season when can I start making multiples of whatever my latest handcrafted project is to give as gifts to my friends, family, neighbors, teachers and so on. And I enthusiastically support the movement to buy local and support the self-employed artists and entrepreneurs that live and work in our own communities. I am grateful that Lt. Gov. Roberts, Chair of the Small Business Advocacy Council, announced Buy Local RI in 2009, a statewide initiative to grow sales and consumer base for locally owned businesses during challenging economic times. This is especially relevant given the increasing fervor to buy massive amounts of product from massive stores at ungodly hours on a holiday. So this year, I’m going to select locally hand-made products not only to support the business of local artists, but also to save myself some time and enjoy the journey of shopping for treasures to give to the people I care about. Not to mention the added benefit of giving really cool gifts that you won’t see in commercials! Join me, and the folks at Festival Fete, in supporting local artists – either at your local stores or craft fairs – or if you live anywhere near Rhode Island, at Festival Fete’s Holiday Market on December 1st and 2nd at Garden City Center. The name of Courtney’s business, “Batting” was a perfect fit for a pillow company owned by someone with the last name Batt. She graduated from the University of Massachusetts Dartmouth with a BA degree in textile design and she currently works as a colorist for a textile design company.It was her mother that encouraged her to use some of the fabric that she collected to start making pillows, and that led her to create one of a kind decorative accent pillows out of re-purposed and vintage fabrics. She finds inspiration and motivation for her business when she remembers at her first show a customer said to her, “Don’t ever stop making these”. She researches the latest color and design trends in interior and fashion, and she sometimes creates a pillow off of an outfit that she loves. I create a luxurious collection of bath and body products designed to engage your senses, pamper you in style and add a sparkle of old Hollywood inspired glamour to your everyday life. All of our products are made with skin loving oils of Avocado, Sweet Almond, Olive and Coconut. And rich Shea butter which is known for its powerful healing benefits. Starlet Glam’s products are free of Parabens and harsh sulfate detergents. I’ve always been involved in Arts & Crafts growing up. 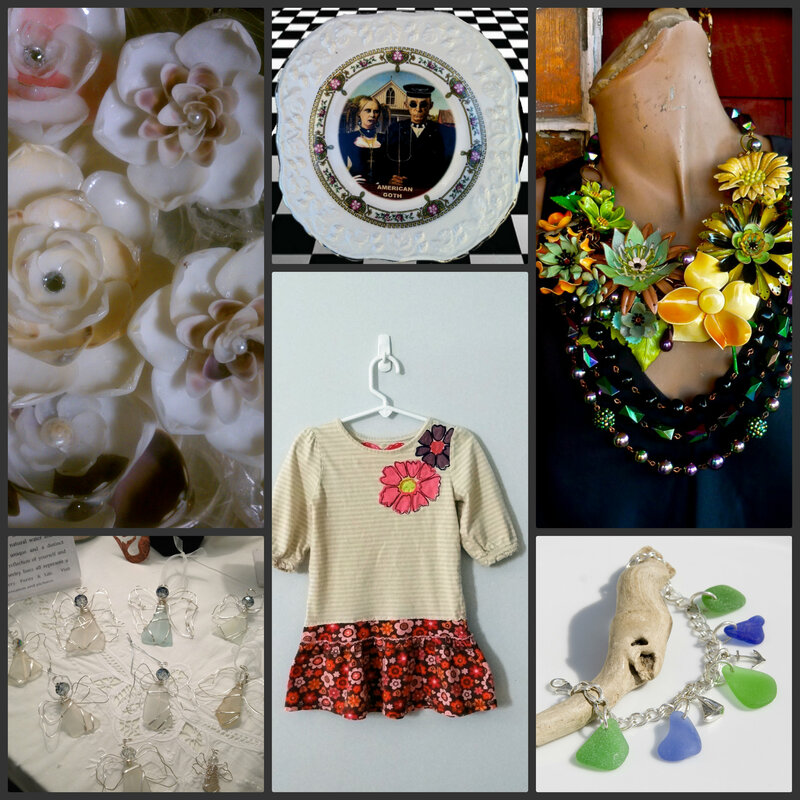 I dabbled in Painting, Graphic Design, Hat Making, Jewelry Design (Polymer Clay). While I enjoyed each craft I felt something was missing. One day I discovered a DIY lip balm article that piqued my interest. The web site also sold soap making supplies and fragrances. Bath & Body products have always been an addiction for me so I knew this would become my passion! I’m hoping for Starlet Glam to be a household name! I’m in partnership with a local Salon to grow my business with numerous wholesale accounts in upscale boutiques across the U.S. I participated in the 2012 GBK MTV Movie Award Gift Lounge and gifted several celebrities through CupcakeMAG. I hope to continue targeting celebrities in the future. See these lovely artisans and more at Festival Fete’s Holiday Market on December 1st and 2nd at Garden City Center, Cranston, RI. Have you heard? Ladies of the Rolling Pin will be in the house! This totally unique Morris dancing group is prepared to entertain you while you shop at Festival Fete’s Holiday Market on December 1st and 2nd at Garden City Center, Cranston. Ladies of the Rolling Pin are an effervescent and truly unique blend of Border Morris from Olde England interspersed with a generous helping of Yankee Ingenuity, all cooked up in Wakefield, Rhode Island. Morris dancing is England’s national dance – and is known to have existed since the late 1400s – while Border Morris dancing emanates from the border between England and Wales (and specifically from the rural counties of Shropshire, Herefordshire and Gloucestershire). Morris dancing is synonymous with festive merriment and revelry, and was performed both the in streets and even provided entertainment in the royal court of Henry VIII – although until the 20th century was a male-only activity! The Ladies of the Rolling Pin have been simmering our delectable and unique blend of Morris Dancing since 1998 and have a well-deserved reputation of being flour-dusted tarts. Some of our dancers are also our founding members but we’re also very fortunate to have a loyal band of very talented (and also tolerant) musicians, without whom, we would be nothing! We’ve performed in England (two tours to date) as well as far and wide across New England, both at ales and at various local fairs, festivals, farmers’ markets and community events. We love sifting our flour and spreading frivolity and smiles whatever the excuse to kick up our heals and raise our rolling pins! As one of our favorite mantras goes “We’re out of the kitchen because the kitchen is closed”!! Click on the image below to see a video of the Ladies of the Rolling Pin in action, then come to Festival Fete’s Holiday Market in Garden City to see them live! They will be performing on Saturday, December 1st starting at 11:00 am. Not quite as “riotous” but definitely entertaining, the wonderfully talented Rhode Island Children’s Chorus will be performing on Saturday from 1:00 – 2:00. The Rhode Island Children’s Chorus is an incorporated, non-profit 501(c)(3) organization, which was founded in 2003 by Christine Noel, its Artistic Director and Joyce Wolfe, Executive Director. From its beginnings with 14 singers, the chorus has grown to over 200 current members and is composed of six choirs. The Children’s Chorus hosts two major concerts a year, where all groups perform both separately and jointly. In addition, the combined group appears at many local and regional invitational events – and we are honored to have them at Festival Fete’s Holiday Market! On Sunday, December 2nd, we will have the Cranston Cello Choir performing from 11:00 – 12:00, and then at 2:30 the Irish Dancers, Tir Na Nog will perform. 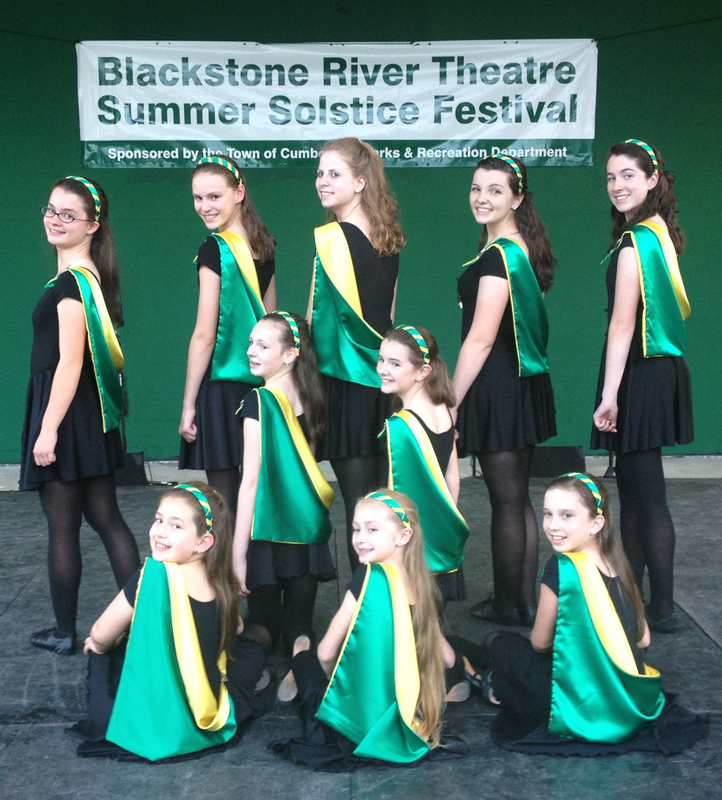 Tir Na Nog Irish Dancers are based out of Blackstone River Theatre, in Cumberland, R.I. Under the direction of Erika Damiani, all the dancers learn traditional Irish and modern-day choreography, solo and group steps, and ceili dances. Dancers range in age from 7 to adult and perform at festivals, parades and private and public events. If you are interested in lessons, or having them perform, please contact Blackstone River Theatre at 401-725-9272 or email ErikaIrishDance@gmail.com. We hope you enjoy their performance! The Holiday Market will be open from 10-5 daily on December 1st and 2nd, and there is a $3 suggested donation to support Art is Smart. There will be plenty of additional entertainment for the whole family as you shop together and get into the merry spirit of the holidays! Wachusett Mountain, celebrates winter fun for families with skiing, snowboarding and various other activities on their many trails and facilities. A painting that brings summer’s warmth to a cold winter day. A delicate leaf-shaped choker that feels like a hug from nature. Some of the best things in life really do come in the smallest packages. Those who appreciate the little things will enjoy “Small Treasures,” the November gift show featuring small artwork – and big hearts – at the Artists’ Cooperative Gallery of Westerly. Come meet the artists at the show’s Opening Reception – Wednesday, November 7th from 5 PM to 8 PM. The show continues until December 1st. The Jamestown Art Center is having a Print Studio Opening tonight, Wednesday, November 7th from 6-8 pm. Featuring work from JAC instructors and students. For more info, visit the Jamestown Art Center’s website. We love to support our local artists! One of Festival Fete’s Holiday Market artists, Courtney Batt, owner of Batting Designs will be selling at the Craftopia sale this Sunday, November 11th from 10 am – 4 pm at Hope Artist Village, 1005 Main Street, Pawtucket, RI. Cornucopia is a fine arts juried show and sale that benefits student arts program at the Pennfield School. There will be more than 60 artists showcasing and selling their handmade items. The artists’ palette cafe will also be available for lunch and snacks. Time : 9 a.m. – 4 p.m. Admission : $2 at the door; children admitted free. Thank you to our sponsor Tricom! LADD OBSERVATORY Check out this oversize earthenware charger measuring a generous 11 and a half inches across! Decorated in a bold blue and two-tone green leaf pattern with an abstract geometric pattern on the rim. Gracing the center is a depiction of a landmark observatory – located in Historic Providence, which is a city known for “Boldly going where no man has gone before”! RHODE ISLAND STATE HOUSE This nice earthenware, hand painted charger measures over 10 inches in diameter and is painted in “spaghetti sauce red” bands with green accents! Situated ‘politically correct’ in the center is a nice postcard depiction of the Capitol Dome of Providence, Rhode Island lovingly embraced by the state’s favorite Crustacean. Is there something fishy going on at the capitol? You tell me. COLLEGE HILL An ‘OLD IVORY’ China plate in bread and butter size, measuring 8 inches in diameter, is the canvas for this landscape of College Hill in Providence, Rhode Island. Handpainted with a delicate floral design in Robin’s Egg Blue and gold scroll work. The recognizable home to Brown University and Rhode Island School of Design is seen here on just another average day on lovely College Hill. VISIT SCENIC RHODE ISLAND A nice 10 inch earthenware server in a cheerful ‘picnic’ pattern of yellow and orange checkerboards, polka dots and blue banding with flowers! A very ‘summer-time’ design reminding us to Visit Scenic Rhode Island…if not for the scenery then at least try a LARGE order of Calamari!